In 1856, the Franciscan Fathers of the Santa Barbara Mission considered the ecclesiastical needs of the residents of Montecito. On July 16th, 1856, a priest traveled from the Mission to Montecito to celebrate Mass in a meadow and to announce that a chapel would be erected around the location of that first Mass. 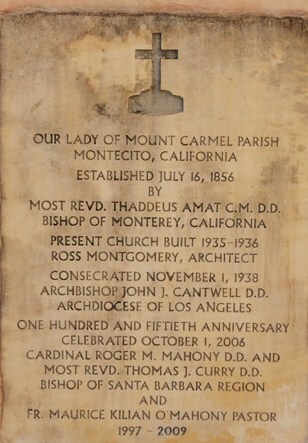 On Sunday, February 28th, 1857, more than 200 people witnessed the placement of the cornerstone of Our Lady of Mount Carmel Church by Right Rev. T. Amat, Bishop of Monterrey and Reverends Sorentini and Serrano of the Santa Barbara Mission. On October 9th, 1858, land was deeded for a chapel on East Valley Road by Victor Juarez and his wife, Maria Dominguez. The first chapel was an adobe structure that stood east of the present church and was called ‘Nuestra Senora del Carmelo,’ consecrated on July 23rd, 1877. During the early years of the parish, priests traveled from the Santa Barbara Mission each Sunday to perform Mass, initially in a field and later in the new chapel, which could seat 60 people. In the late 1800’s, irrigation allowed agriculture to flourish and the population grew with many families from the Mid-west moving to California. A white wooden church was built at the current location of the church at the corner of Hot Springs and East Valley Roads to accommodate the growing parish community. In 1905, Our Lady of Mount Carmel parish had its first resident pastor, Father William Lonergan, followed by Father Anthony Serra. The parish became an increasingly important part of the lives of parishioners as sporting and social activities were hosted for the community. During this time, tourists to Santa Barbara frequently took carriage rides to Montecito, and many visitors decided to build homes and estates in Montecito. Among the new residents of Montecito were Mrs. William N. Nelson, and the Misses Clara and Mary Cudahy. These three women, sisters who moved to Montecito from the Mid-west, funded the construction of what is the current Our Lady of Mount Carmel Church. The parish pastor, Fr. John Cox, hired Los Angeles architect Ross Montgomery, as he was well-known for his extensive knowledge of pueblo style architecture. Montgomery had designed many homes and churches in Southern California, and he and his partner, William Mullary, designed the current church in an architectural style developed by Jesuit priests. These early missionaries combined the building patterns of the Pueblo Indians with early Spanish Colonial design to create a uniquely Southwestern architectural style. Records show Montgomery selected the best features of several different Southwestern churches, including a courtyard and mellow façade, an interior ceiling of eucalyptus saplings in a herringbone pattern, and an altar filled with natural sunlight and the brilliant red and blue on the hand-carved reredos (altar screens.) The tabernacle, sanctuary lamp and altar crucifix are silver in the spirit and design of the 17th century Spanish-colonial silversmiths. Light fixtures and other metal work of repoussed tin were hand-crafted by Native American artisans in Santa Fe. The altars, baptismal font and flagstone floors are made of Santa Barbara sandstone. The landscape architects, Lockwood de Forest and Stephen Benizik, were mindful to ensure that the design reflected a typical Southwestern landscape. The new church was consecrated in 1938, and it is one of a very few in the Los Angeles Archdiocese with this authentic southwestern pueblo character. The donors of our beautiful church, Mrs. Nelson and her sisters, Clara and Mary Cudahy, are remembered in a commemorative plaque in the Church Sacristy. Father Cox, who led the construction of new church, passed away in 1939, leaving a legacy of generosity to those in need during the Great Depression. It is said that no one was turned away from his door. Father John Meehan became pastor in 1939 and served until 1952. Fr. Meehan was passionate about starting the parish school, and he embarked on a letter writing campaign to encourage parents to send their children to the new school, even providing transportation to students who may not otherwise have been able to attend. In 1944, Our Lady of Mount Carmel School opened its doors to fifty students who were taught by Sisters of the Immaculate Heart Order, who operated the school for the next twenty-four years. Fr. Meehan also created the Church’s traditional Indian Christmas crèche. Msgr. Ozias Cook served as pastor from 1952 until 1968. Msgr. Cook was a Navy Chaplain serving in the Marine Corps during World War II. Msgr. Cook presided over the efforts for the new school building, dedicated on March 28th 1954, and the completion of a chapel in 1963, expanding the capacity of the church from 300 to 600 parishioners. Father Henry Van Son served as the next pastor, until 1990, and the parish steadily grew. Msgr. Sylvester O’Byrne followed Fr. Van Son as pastor, and during his tenure the parish grew to 550 families, and attendance at Mass averaged 400 to 450 every Sunday. Our Lady of Mount Carmel parish was home to parishioners of all ages. On May 1, 1991, Father Carroll O’Sullivan joined Msgr. O’Byrne as a resident retired priest, and he remains at Our Lady of Mount Carmel as a Spiritual Advisor, as well as performing the Mass and as parish administrator in 1997. Msgr. O’Byrne retired at the end of 1996, and remained at Our Lady of Mount Carmel as a resident retired priest until 2003, when he returned to his native Ireland. Fr. Maurice O’Mahony became the parish pastor in 1997, and he presided at the Parish Sesquicentennial Celebration in 2006, when the parish had grown to almost 1000 registered families. During his tenure as Pastor, Fr. O’Mahony oversaw the establishment of an art center for students as well as the addition of beautiful new furniture for the Altar. Today, Fr. O’Mahony works at Our Lady of Mount Carmel as Pastor Emeritus. Monsignor Stephen Downes became Pastor of Our Lady of Mount Carmel on July 1, 2009. His joy in ministry comes from serving the children and families in our parish school and religious education programs and the Youth Ministry and Confirmation programs; the leading of Bible studies; the beginning of the RCIA program for Non-Catholics interested in learning about our Catholic faith and for adult Catholics who need to prepare for Confirmation and First Holy Communion; and ministry to the sick in our parish and at Cottage Hospital; and, like all the priests who have served at Our Lady of Mount Carmel Parish, working with parish staff and parishioners to meet the spiritual and pastoral needs of the people of our parish and community.